D-Day On CIA Spies-Swap Saga Is Here SECRETS ON THE DIRTY laundry of Ghana's infamous Spy story and the Reagan administration's decision to swap eight Ghanaian agents of the Central Intelligence Agency (CIA) for the debonair Ghanaian spy, Mr. Michael Agbotui Soussoudis, would be laid bare today at the National Reconciliation Commission (NRC) sitting. This follows the decision by Mr. Kwamena Ahwoi, a former minister under the PNDC/NDC administrations to testify before the NRC despite the inability of his accuser, Major (Rtd.) John Kwaku Awuakye to avail himself for cross-examination. Speaking Saturday evening in a phone interview with the Gye Nyame Concord, Ahwoi said he will present his side of the story on the controversial exchange of the eight alleged CIA agents. He said though he was disappointed that his accuser has failed to present himself for cross-examination, he would appear before the NRC to tell the truth about the spy scandal. He admitted however that the absence of his accuser would mean that he might have to hold on to some information on the spy saga, but insisted that depending on what the Commissioners do and how they play their cards, he might hold a press conference on the issue. If they play games with me and try to frustrate me, I'd hold a press conference and let the public judge, he told this newspaper, though he also admitted that the classified nature of the issue and the conditions that underpinned negotiations on the spies-swap saga meant that he himself would have to walk a tight rope on the evidence that he would give. The murky detail of the CIA-agents bust-up is still classified in the US and is noted by most intelligence analysts, Intel websites and Intel books as one of the significant failings of the revered Central Intelligence Agency. It is also cited on major websites on the Intel industry and is captured in several books on espionage. 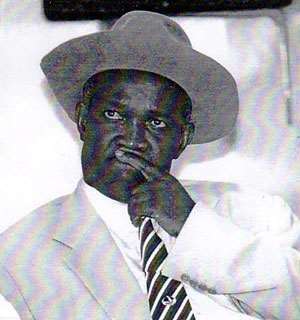 At the time of the swap in December 1985, Mr. Ahwoi was Chairman of the Citizens Vetting Committee (CVCC). In his evidence before the NRC, Major Awuakye claimed he was de-nationalised together with the seven other Ghanaians who were exchanged on the basis of false allegations; something Ahwoi would contest today. Major Awuakye in both his petition and evidence before the NRC accused Ahwoi of being part of a denationalisation plot by the PNDC that allegedly de-nationalised him. The eight were mutually swapped for Soussoudis by the erstwhile Provisional National Defence Council (PNDC) and the conservative Reagan-led US administration following fears that the erstwhile military regime would eliminate them after being identified as spies on a database downloaded from the CIA station office in Accra and handed over to the regime by Ms Susan Scranage, a diplomat and girlfriend of Soussoudis. Ms Scranage was secretary to the CIA chief in Accra at the time and girlfriend of the 39-year-old flamboyant Soussoudis, cousin of Rawlings and agent of then national security capo, Captain (Rtd.) Kojo Tsikata. Soussoudis seduced Ms Scranage, described in limited CIA documents accessed by this paper weeks ago as a “shy, naive, country girl who had never before been overseas” into turning over classified information, including the identities of then CIA agents and informants, to the PNDC. Widely publicised information in the US at the time of the event in 1985 indicates that Ms Scranage passed to Soussoudis damaging amounts of classified information, including the identities of several CIA agents in Ghana, which the struggling administration used to its security advantage. Captain Tsikata, the security capo at the time, is believed to have also shared his take on the suspected CIA agents with Cuba, Libya and the Soviet Union, whilst holding that of the KGB agents. Among those swapped for Soussoudis were Naval Capt Oppong, first Chief of Staff of the PNDC regime, who was working at the office of the then PNDC Chairman and one Colonel Bray, a military officer whose brother was a Deputy Director of the Ghana Education Service. Colonel Bray is a former student of Prempeh College in the Ashanti Region, Kumasi. Mr Abel Edusei, presently CEO of the state-run Ghana National Procurement Agency (GNPA), Mr Adu Gyamfi, a former Managing Director of the one-time national conglomerate, the Ghana National Trading Corporation (GNTC), who had been posted to head the Achimota Brewery Company (ABC) at the time, and Major John Kwaku Awuakye, Deputy Director (Organisation and Plans) at the Ministry of Defence and one-time Acting Commanding Officer of the Base Ordnance Depot were reportedly among the eight fingered by the database. Sources say the database sourced by Soussoudis through Scranage had many people on it, including double agents and others suspected by the CIA of spying for their Cold War rival, the infamous KGB of the former Union of Soviet Socialist Republics (USSR). But Major John Awuakye, the former Ordinance Officer of the Base Ordinance Depot of the Ghana Armed Forces has alleged that he was falsely declared a CIA agent, denationalised and unlawfully sent to the US with his family. He has requested the NRC to direct that he should be compensated because his deportation to the US caused him undue hardship. He has also called on the NRC to issue him with a new passport to replace the old one that was taken from him, cancel his release from the Army for alleged misconduct and compensate him for the suffering that he and his family went through over the last two decades in the US as a result of the deportation. He also wants the NRC to grant him the use of his military rank in civil life and pay all entitlements due him with interest and appropriate compensation. (See full details of his petition on Thursday). His justification, he says, is the fact that his release was without just cause, as he did not reach the compulsory retiring age of a major. He noted in his petition that: “On or about November 21, 1985, the then director of Ordinance Services, Ministry of Defence, conveyed to me an order that I should report to the police headquarters in my own interest. By the nature of the message, I immediately reported to the police headquarters and was directed to see Kwamena Ahwoi. He said Ahwoi told him that there was no option in the case and that his safety in Ghana could not be guaranteed, if he refused to leave for the United States. He said he was then asked to surrender his passport two days later and together with the seven others were escorted in a convoy to Lome, Togo, from where he emplaned to the USA. Meantime, earlier web-investigations and accessing of major Intel websites by the Gye Nyame Concord confirmed that the scandal is of significant importance to experts on CIA espionage affairs. Despite being classified, the scandal is alluded to in the 358-page book, “Inside the CIA”, published by Pocket Books of New York by Mr. Ronald Kessler, the first outsider to be allowed a tour of the CIA headquarters, and granted interviews with present and former CIA officials. Wendell L. Minnick, another American also captures the story in his 310-page book “Spies and Provocateurs: A Worldwide Encyclopaedia of Persons Conducting Espionage and Covert Action, 1946-1991” published in1992. Another major Intel book that captures the scandal is the 248-page Nigel West's “Games of Intelligence: The Classified Conflict of International Espionage Revealed”, published 13 years ago. The Washington Post in 1985 also captured the scandal in various editions. In one of its editions, it wrote: “1985 - SHARON M. SCRANAGE, operations support assistant for the CIA stationed in Ghana and her Ghanaian boyfriend, MICHAEL SOUSSOUDIS, were charged on 11 July with turning over classified information, including the identities of CIA agents and informants, to Ghanaian intelligence officials. It is reported that a routine polygraph test given to Scranage on her return to the US aroused CIA suspicions. Following an internal investigation, Scranage agreed to cooperate with the FBI in order to arrest Soussoudis, a business consultant and permanent resident of the United States. According to one report, damaging information on CIA intelligence collection activities is likely to have been passed on by pro-Marxist Kojo Tsikata, head of Ghanaian intelligence, to Cuba, Libya, East Germany and other Soviet Bloc nations. Indicted on 18 counts of providing classified information to a foreign country, Scranage subsequently pleaded guilty to one count under the espionage code and two counts of violating the Intelligence Identities Protection Act. Fifteen remaining charges were dropped.